Once upon a time, long, long ago, in November, there were two tiny buds. And look what they became – right in time for Christmas. 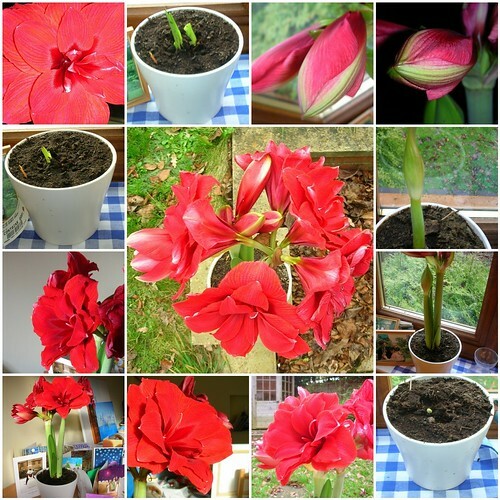 This is the Amaryllis Double Dragon – all red and roaring and the perfect Christmas colour. The first stem produced four enormous blooms and the second stem is taking up where they will leave off with another four. I’ve been trying to take decent pictures of this for ages but it seems impossible to capture the velvet sheen in the very centre of the bloom, or the shot silk effect of the furled buds. All I can do is keep checking them daily and enjoying while they last. And I’ve still got an Apple Blossom to go. 1, They are not as prickly. It is possible to hold onto one without needing to be wearing a coat and the oven gloves. 2, They drop very few needles. 3, Until the branches ‘drop’ it does look rather as if you’re buying a Christmas hedge not a Christmas tree. 4, Most importantly, the trunk may be significantly thicker than that the same height tree in another variety. We have a little metal Christmas tree stand – you pop the trunk in the hole, screw in the bolts and remember to keep watering the tree and all is well. Or so you would like to think. On the Sunday that we bought the tree it came home in the car, we pulled it halfway out of the boot and went to get the tree stand to bolt it on. Slight hitch – the trunk was bigger than the stand. And so began one of the more entertaining hour and a halves that I have spent recently as H sawed away small slivers of tree trunk to try to make it fit. 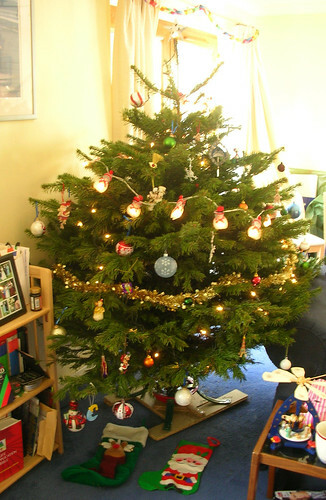 As most of the cutting involved H standing in the boot of the car and me grasping the tree to myself in a semi recumbent posture to try to stabilise it we could see how entertaining we would look to anyone that passed by, and started giggling. And, with perfect comedic timing, it was at this point that our next door neighbours and around 40 of their guests returned from a relation’s 70th birthday party. In beautiful frocks, smart suits and covered with balloons, they traipsed up the drive. Of all 40 ish, only five or so made any comment at all; it was so terribly terribly British. The story ends well as you see as H not only managed to slim the tree trunk to fit the stand, but also created a bracing system for the stand itself (which you can just see in the bottom of the picture) which apparently stops the stand legs flaying out everywhere and makes the tree stand up. The last time I studied physics I was 15 so I just say Yes Dear. The only thing that has to be done for Christmas day itself is the foot of a sock so if I can escape from H long enough to finish it we should be OK. I was planning to finish it on the train and at work but with inescapably brilliant timing I have gone down with the office cold in impressive style – I was fine yesterday morning and by yesterday 4pm I couldn’t really string together coherent sentences – so I’m spending the day tucked up in bed to try to get rid of it before Christmas. If you need me, I’ll be the one knitting under the duvet in between naps.